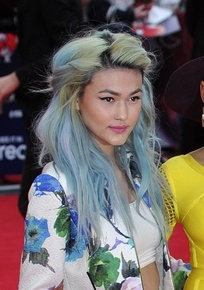 Asami Zdrenka is British singer. She is a former member of the British band Neon Jungle, along with Shereen Cutkelvin, Amira McCarthy, and Jessica Plummer. Asami was born in Japan. Her father has English, Danish, and Irish ancestry. Her mother is Japanese. Asami was raised in Suffolk, England. I think her grandparents were Francis Charles Zdrenka and Sheila Ann Abbott. Francis was the son of Richard Francis Johannes Zdrenka and Hilda Lynch. Richard was born in Denmark. Zdrenka is a Polish last name.